In the high-intensity world of student prospecting, everyone is looking for a competitive edge--but one of the greatest "edges" you can have is to simply understand what prospective students want, need, and expect and align your actions accordingly. Intelligence collected by EducationDynamics, a higher education marketing information and technology services company, suggests four strategies colleges and universities can adopt to increase success related to prospective students. 1. Speed and consistency of contact have the greatest impact. Swift response matters. In fact, today's prospective students expect it. The most competitive schools make initial contact within 30 minutes of initial inquiry. To help improve response time, schools should consider round-the-clock monitoring and employing a dedicated staff. Also, for the best return on your post-inquiry efforts, it pays to place the greatest emphasis on those prospects most likely to convert rather than placing equal importance on every lead generated. An upgraded customer relationship management (CRM) system or an inquiry management system that coordinates with an existing CRM can enhance these efforts by identifying and prioritizing high-quality inquiries while also flagging those that are under performing, as well as the sources they came from. 2. Quality of contact sets the student's value expectation. Focus on information: Gather information from prospects and share information about program offerings to establish an initial relationship. Tailor the form used to solicit information to capture critical data (program interest, timeframe, scholarship/financial aid need, ability to meet the institution's admissions requirements, etc.) and maximize the analytics of your CRM or inquiry management system to be best prepared for the introductory conversation. Once contact has been made, be sure to listen carefully to their responses and clearly communicate information related to their unique needs. Further, consider deploying brief and engaging surveys to collect additional information to help facilitate productive and successful future exchanges. Surveys can be administered directly via e-mail, or prospective students can be invited to participate through social media outlets (offer multiple opportunities for them to connect with you on Facebook or Twitter either from your Web site or other online communication). Because prospective students' expectations and needs may change as they navigate through the decision-making process, this will allow you to be responsive and empowered with the most current information. Another way to better establish an initial relationship is to recruit current students to be part of the contact team, connecting peer-to-peer, whether for younger or older students. The contact team should be well informed and able to answer questions quickly, completely, and using detail that is likely to help support faster decision making by prospective students. 3. Method of contact should align with the student's stated preferences. Let prospects dictate how and when they want you to communicate with them, and then do it. As part of that multi-channel approach, develop a communications strategy and messaging that is equally effective for e-mail, phone, Web, or print delivery. The other key factor in contact success is to be consistent with follow-through: Create a time-lined and/or event-driven series of contact points and make sure that these are followed without exception. 4. Web-based prospecting activities start with a great Web site. Creating an information-rich Web site that gives prospects multiple opportunities to interact with an institution and its representatives (students, instructors, graduates, etc.) helps prospects learn more about an institution's program offerings, as well as details about financial aid, tuition, and the admissions process. Wesleyan College, a private, four-year liberal arts school for women, is an excellent example. Wesleyan offers a clear call to action from its home page, directing prospective students to a comprehensive microsite that includes videos on academics, faculty, research, athletics and campus activities and organizations, as well as alumnae, counselor and faculty profiles, and an interactive campus tour (with videos). Additionally, special attention should be paid to the user experience: Make sure that navigation is easy and content and design is consistent. For example, Loyola University New Orleans offers prospective students at all levels--undergraduate, graduate, law, evening and international--an engaging and interactive experience that feels fluid and informative. 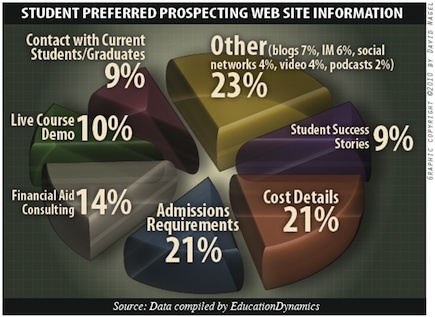 Your Web site is often the first impression a prospective student has of your institution. If anything about it is confusing or unappealing, a prospect's interest may end at your home page. But this should be considered just the beginning of online efforts. You should commit to learning about and adopting leading social media tools (Facebook, LinkedIn, and Twitter, for example) to reach students where they congregate online. Implemented properly, these four strategies will provide an effective foundation for your prospecting efforts. Most importantly, however, be flexible, opportunistic, and creative in the approaches you take to connect with your prospects. Let your prospecting team know that you are open to exploring new ways to "get the message out" via technology and encourage them to present new ideas that use new tools or existing tools in new ways. Giving prospects what they need and responding to them effectively at the start of the school-student relationship not only helps drive increased enrollment yield, but also ensures students are matched with programs that best reflect their educational goals. Additionally, when you tailor your outreach campaign to student preferences at the beginning of contact, you set the stage for a mutually beneficial, trusting relationship throughout the student lifecycle. Bottom line: in today's online education market, students have a lot more choices. Your competitors may be down the street, across the country, or on another continent. But you have to assume that they will be searching for ways to tailor their enrollment management campaigns to most effectively sell their programs. If you aren't already, you should be, too.